Manu covers a total of 4.5 million acres of pristine rainforest from the crystalline cloud-forest streams to the sluggish, chocolate-brown rivers of the dense lowland jungle. Manu’s environment has been unchanged for thousands of years, thus allowing more species of plants and animals to evolve here than in any other similar area of the world. In The Manu, you can observe a variety of animals in their natural habitats, including: Giant Otters (Pteronura brasilensis), Black Caiman (Melanosuchus niger), the majestic Jaguar (Panthera onca), the strange Spectacled Bear (Tremarctos ornatus), the Tapir (Tapirus terrestris), the Ocelot (Felis pardalis), 13 species of primates, and an estimated of one thousand species of birds including species of seven Macaws (Ara sp.). Manu also contains 10% of the world plant species, including several species of figs and palms, as well as countless species of medicinal plants that scientists are currently cataloguing. A single hectare of forest in Manu can have up to 220 species of trees, while a hectare of temperate forest in Europe or North America may only have 20 species of trees. The Manu National Park is probably the most biological diverse and protected park on the planet. The best time to come to Manu is during the dry season from June to October. 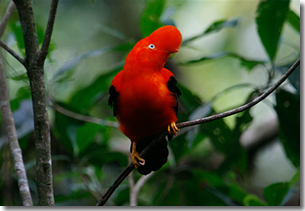 Peru tours offer you the rich biodiversity of the Amazon rainforest !